Into the deep and fresh out the ocean is the return of Sharko & Remi from Quiccs x CHK DSK x Devil Toys! This all-new fully painted version “Campus Heartthrob Edition” is arguably the best version we’ve seen to date and its headed to Thailand Toy Expo 2018. 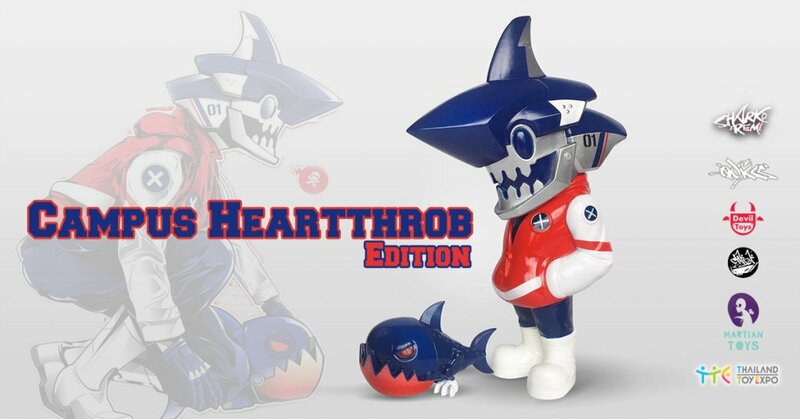 No doubt Quiccs x CHK DSK x Devil Toys “Sharko & Remi” soft vinyl figure has been a smash hit since its launch and this Campus Heartthrob Edition ain’t gonna be easy to cop so better get on the phone to your plug if you wanna own one. Limited to only 100 pcs! At Eden 1 Booth A18.